Dietary lipids are commonly included in pig diets to increase energy density, reduce dust and improve palatability of the feed. Pigs easily digest dietary lipids, and inclusion of dietary lipids usually improves gain to feed due to the high metabolizable energy in lipids. Results of research indicates that addition of dietary copper (Cu) at 250 mg/kg in diets for weanling pigs containing 5% animal fat improved growth performance, and it was speculated that this was due to the ability of Cu to improve animal fat utilization and enzymatic activity. Dietary Cu may also affect the bacteriostatic properties in the intestinal tract, helping improve gastrointestinal health and immune function of pigs. An experiment was conducted at the University of Illinois to test the hypothesis that inclusion of 150 mg/kg Cu from Cu hydroxychloride (Intellibond CII, Micronutrients USA, Indianapolis, IN) to diets based on corn, soybean meal and distillers dried grains with solubles (DDGS) improves gain to feed of pigs. The second objective was to determine how much dietary fat may be replaced by adding 150 mg per kg of Cu hydroxychloride. A total of 144 pigs with an initial body weight of 15 kg were allotted to six treatments with two pigs per pen and 12 replicate pens per diet. 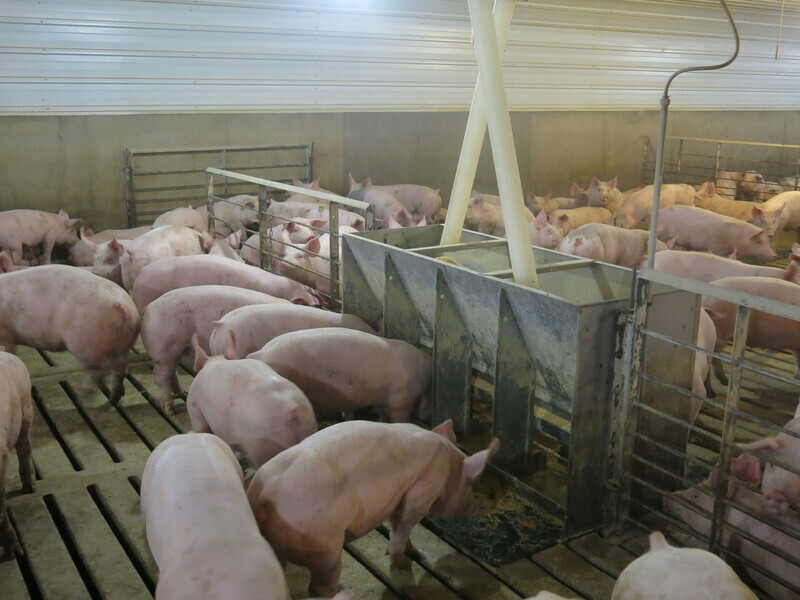 Pigs were fed diets with increasing concentrations of extracted fat by adding 2%, 4% or 6% choice white grease to a diet based on corn, soybean meal and DDGS, which contained no choice white grease. Two additional diets were formulated by adding 150 mg/kg of Cu from Cu hydroxychloride to the diet without added choice white grease and to the diet with 2% added choice white grease. Diets were fed to pigs for four weeks. Based on the improvement in gain to feed that was obtained by including choice white grease in the diet, a regression analysis was used to calculate that gain to feed increases by 0.022 percentage units for each unit of choice what grease that is included in the diet. That means that inclusion of choice white grease in diets for growing pigs will improve feed conversion rate. Supplementation of Cu hydroxychloride to the diet without added choice white grease and to the diet containing 2% choice white grease improved (P less than 0.05) gain to feed of pigs for the overall experiment. Based on the prediction equation, it was calculated that the improvement obtained by 150 mg/kg of Cu hydroxychloride supplementation was similar to the improvement in gain to feed obtained by adding 2.8% to 3.8% choice white grease to the diets (Figure 1). In conclusion, supplementation of 150 mg/kg Cu as Cu hydroxychloride to diets improved gain to feed of 15 to 35 kg in pigs. The improvement obtained by adding Cu hydroxychloride to the diets was similar to the improvement in gain to feed obtained by adding 2.8% to 3.8% choice white grease to the diets.